This is the type of yeast that I recommend and use in my video. You can't go wrong. It is a food service product, fresh and vacuum sealed. Once opened you can store it for a year plus in your freezer. I have consistently had good results with Red Star. Bread baking has become a lost art. A generation or two ago your mother or grandmother made bread for the family. Today we just don't know how anymore. We forgot! VIDEO BREAD BASICS will show you how to make a basic loaf of bread. The process is explained in detail from start to finished loaf. You will learn to proof your yeast and gain a through understanding of it's function in baking. How the gluten in flour forms the structure of the finished loaf. How to knead dough and for how long. How to shape your loaf and how long to bake it. 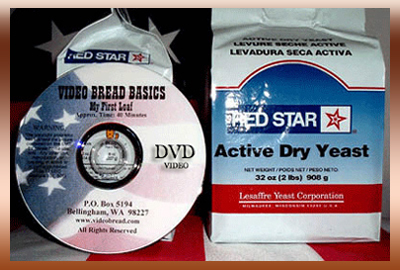 VIDEO BREAD BASICS is visual step-by-step instruction. It's a cooking class that you take at home, in your spare time and at your own pace. No previous baking experience is required. 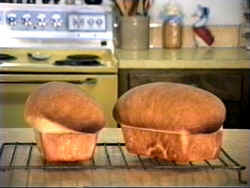 VIDEO BREAD BASICS will encourage you to learn more about bread baking. Maybe you haven't made bread for years and just need a refresher course. Maybe you've never made bread before in your life. Learn right from the start. It's great fun. Bread baking is a craft. You can make better more nutritious bread than you can buy. Cost is another incentive for making your own. A good loaf of bread in the store is not cheap anymore. You can make that loaf for a fraction of the cost. Need more information send me e-mail (videobread@gmail.com).